In Nvidia's CES keynote segment that focussed entirely on gaming, Nvidia Founder and CEO Jensen Huang showed attendees a video from upcoming RTX game Atomic Heart. 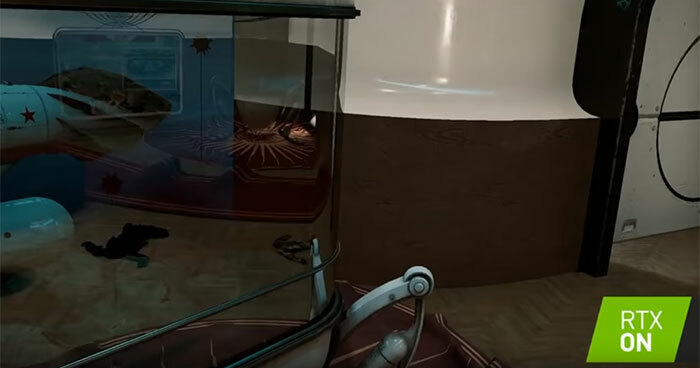 We've seen some scenes and video showing Atomic Heart in action last year, however on stage at CES Huang toggled RTX On and Off to show a stark difference in these in-game graphics. 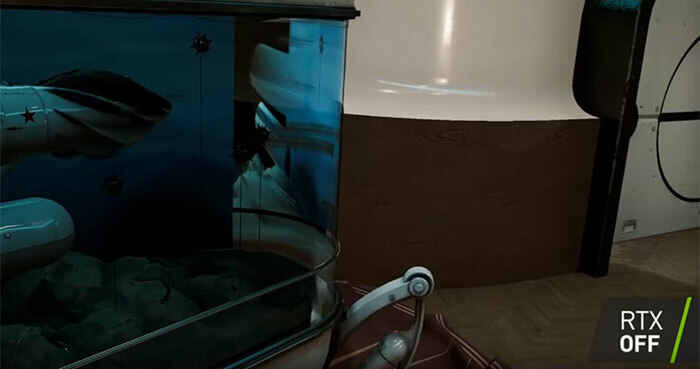 The reason for the marked difference, with RTX toggled in the scenes shown (see images above and below for example), was down to the plethora of mirror finished surfaces in the Russian labs depicted in the game. In short, there was a lot of potential for reflection and refraction in the scenes that were hard to fake without real-time ray tracing. According to a report published by Game Debate earlier today, Nvidia CEO Jensen Huang has said that all the mid- to high-end GTX graphics cards in Nvidia's inventories have been sold. The quote, from an unspecified Q&A session involving the Nvidia CEO, is reproduced below. It came in response to a question regarding the large inventory of GTX GPUs remaining after the collapse of cryptocurrency-based demand. "It's completely a crypto hangover issue. Remember, we basically shipped no new GPU in the market, to the channel, for one quarter. But the amount of excess inventory and market demand, channel velocity — you just have inventory divided by velocity, and that's time. We said that it would take one to two quarters for all the channel inventory to sell out… 1080Ti has sold out. 1080 has sold out. 1070 has sold out. 1070Ti has sold out. In several more weeks, the 1060s will sell out. Then we can go back to business." Here in the UK, Nvidia Founders Editions seem to all be gone, but there are supplies of cards from AiB makers covering potential demand for all the GPUs mentioned above. When Nvidia GTX 1060 supplies are depleted in the coming weeks there will be quite a yawning gap between the $180 GTX 1050 Ti and the $349 RTX 2060. Hopefully, before that happens, we will get to find out what Nvidia will be introducing into this segment. The blind tests vid linked to above makes interesting watching. Can't say that I'll be rushing out anytime soon to upgrade my 1080ti. I think that's most people. I mean rtx stuff just seems like more game works fluff rather than anything that adds to gaming. They keep getting better and better. Soon it'll be full life rendering and we won't ever have to leave the house. It's good there now is an nVidia tech demo for RTX effects. Otherwise people might start to question why they bought into nVidia's new RTX range at all. RTX: cool tech, but can live without considering the cost at the moment.